Do not think that I have come to destroy the Law or the Prophets. I have not come to destroy but to fulfill. For truly I say to you, Till the heaven and the earth pass away, not one jot or one tittle shall in any way pass from the Law until all is fulfilled [G4137]. Therefore whoever shall relax one of these commandments, the least, and shall teach men so, he shall be called the least in the kingdom of Heaven. But whoever shall do and teach them, the same shall be called great in the kingdom of Heaven. For I say to you that unless your righteousness shall exceed that of the scribes and Pharisees, you shall in no case enter into the kingdom of Heaven. Read Matthew 5:17-20 carefully. Note that the word “fulfill” is misunderstood. It is the simple verb for “fill.” Messiah came to “fill up” the law, not abolish it. Too many people make the word “fulfill” mean the same thing as abolish (clearly going against the intention of Yeshua’s saying). Yeshua then goes on to show us what his law is in the rest of the Sermon on the Mount. It is not just to avoid adultery, but lusting. Not just murder, but hatred. Messiah’s law is the Law of Moses interpreted in its fullest sense, spirit and letter, so that we imitate God by avoiding all evil. Just recently, I read an article in the Christian Post by an author I generally always agree with, Mr. John Piper. The article was titled “Are Christians Under the 10 Commandments?” Quite frankly, I was in disbelief at what I had just read. The Christian Post: Are Christians Under the 10 Commandments? John Piper: Are Christians under the 10 Commandments? Jesus Christ (Yeshua HaMashiach) summed up all the Ten Commandments in two commandments. He taught us that if we love God (YHWH) as we should, we will always keep commandments one through four, and that If we love our neighbor as we should, we will always keep commandments five through ten. So which commandments are invalid or obsolete? Honestly, I don’t see one commandment that I try not to keep every day of my life. Of course, I am human and as I result I do sin. However, I ask God to forgive those sins and He promised that he would. Who is a God like you, pardoning iniquity and passing over transgression for the remnant of his inheritance? He does not retain his anger forever, because he delights in steadfast love. He will again have compassion on us; he will tread our iniquities underfoot. You will cast all our sins into the depths of the sea. You will show faithfulness to Jacob and steadfast love to Abraham, as you have sworn to our fathers from the days of old. Grace means that we are no longer under the jurisdiction of the law (which is death). It is not a license to sin. The law is our definition of sin and an example of God’s Holiness Code, it defines how God wants us (expects us) to live our lives. Tradition holds that the commandments written on the stone tablets were burned all the way through the stones. In this way (written on stone and on both sides), nothing could be added and nothing could be removed from the Word of God. 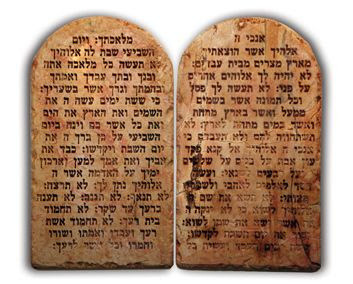 If one reads and studies the B’rit Chadashah completely, they will notice that Yeshua and the disciples taught the Ten Commandments throughout the B’rit Chadashah. Not only did they teach them, but they also lived by them to the best of their abilities. When you are ready as a Christian to accept and admit that the Law was never abolished, you will find it very useful to study the Tanakh (Old Testament). The first five bools of the Tanakh are known as the Torah and include an additional 603 laws for believers (some apply only to women and some apply only to priests). It is interesting that approximately 33% of the prophecies in the Tanakh have not been fulfilled yet, so how can the Tanakh be old? Likewise, approximately 85% of the B’rit Chadashah (New Testament) is quoted from the Tanakh, so how can it be new?